The Atlantic States Gay Rodeo Association is a charitable and social organization whose primary purpose is to promote the sport of rodeo and foster country and western lifestyles in the gay community. Since the founding of ASGRA in 1991, our Association has raised and distributed thousands of dollars to gay, lesbian and other charities in Maryland, Virginia and the District of Columbia. We are one of the largest and most diverse GLSBT organizations in the Mid-Atlantic region, with members throughout the United States and Canada. Our members enjoy the fellowship of numerous social, recreational and educational activities. 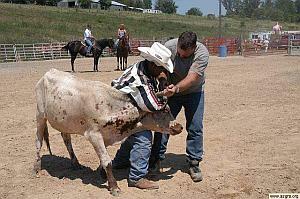 ASGRA educates, trains and fields teams to compete in International Gay Rodeo Association (IGRA) sanctioned rodeos. ASGRA sponsors Atlantic Stampede, our annual rodeo and country western event held in September in the Washington, D.C. metropolitan area. Individual membership in ASGRA entitles you to participate in any IGRA sanctioned rodeo. However, you don't have to compete to be a member. You can still take part in our organization, helping to forward the country western, rodeo lifestyle in the Mid-Atlantic region. Members may choose between Regular or Premium memberships! ASGRA's annual membership year runs January 1, though December 31. Join or renew by credit card using our online application. Free cupcake with $10 purchase (includes food and liquor) at Nellie's Sports Bar when you present your ASGRA Membership Card at the time of purchase. Join or renew by credit card using our online form.